Aim: This study aims to compare efficacy and safety between mesotherapy (intralesional injection) and 5% topical minoxidil solution in male androgenic alopecia (AGA) by dermoscopic evaluation. Methodology: In a randomized active controlled trial, we enrolled 49 clinically diagnosed males of AGA and randomly allotted them into two groups – mesotherapy (A) (25) and minoxidil (B) (24). Males in Group A were given total 8 sessions of intralesional mesosolution with microneedling procedure while Group B males were prescribed topical solution of minoxidil 5% twice daily for 4 months. Results were evaluated at baseline and then monthly for 4 months with clinical photographs, dermoscopy, trichoscan, 7-point standard assessment tool, and patient-self assessment scores. Results: Grade II was the most common presentation in our study. 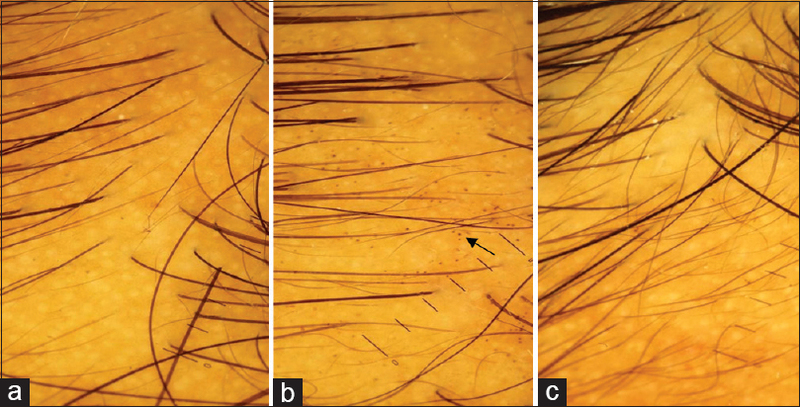 All dermoscopic parameters such as variation of hair shaft diameter, follicular units with single and multiple hairs, yellow dots, and perifollicular halo did not show any significant difference between the groups at all time points except at 1st month where the difference in variation of hair shaft diameter between the two group was 0.04. We observed a significant increase (P = 0.01) in the variation of hair shaft diameter between pre- and post-treatment in mesotherapy group compared to minoxidil group. The rest of parameters failed to show any significant difference within the group in mesotherapy and minoxidil. Conclusion: In our study, we observed a significant increase in the variation of hair shaft diameter between pre- and post-treatment in Group A compared to B. Other dermoscopic, trichoscan, and subjective measurement tool failed to show significant difference between two groups. Our observation suggests that there is no significant improvement of mesotherapy in male AGA over minoxidil. The term “androgenetic alopecia” (AGA) was coined by Orentreich in 1960. Pattern or AGA is a genetically predetermined disorder due to excessive response to androgens which is characterized by progressive miniaturization of the hair follicles on scalp at any time after puberty, in a characteristic distribution in both males and females. In males, hair loss is more prominent in the frontotemporal regions, while in women, the frontal hairline is typically spared with widening of the central partition of the scalp in a Christmas tree pattern. More easy visibility of pattern baldness in males makes them more susceptible to psychological stress. It is the most common type of nonscarring alopecia in men. There are many invasive, semiinvasive, and noninvasive methods available for hair evaluation. Recently, trichoscopy has emerged as a novel, easy, accurate, and handy OPD tool to identify, differentiate, evaluate the condition, and monitor the therapy. Mesotherapy is a Greek word which means treating (“therapy”) the middle layer of skin (“mesoderm”). It involves microinjections of multiple conventional medications, vitamins, pharmaceuticals, and other ingredients into the mesoderm. Till now, though many studies have been conducted with different therapies and evaluated by various methods, we could not find any study about mesotherapy in male AGA which is evaluated by dermoscopy. Hence, we conducted a study to compare efficacy and safety between mesotherapy with microneedling and topical minoxidil 5% solution in male AGA with dermoscopic evaluation. A randomized active controlled trial was undertaken at outpatient clinic of Department of Dermatology between January 2017 and May 2018 after obtaining prior human ethics approval and prospectively registering in Clinical trial registry of India. Following the checklist of CONSORT, a total of 65 males between 18 and 35 years of age with clinically diagnosed mild to moderate AGA (Grades II–V), according to Norwood–Hamilton classification, were enrolled in the study after taking a written informed consent. Sample size was calculated as 70 using Nmaster software taking Power-80 (Nmaster software 2.0 uses STATA, EpiInfo, nQuery and others for sample size calculation. It is from Department of biostatitics, CMC, Vellore.). 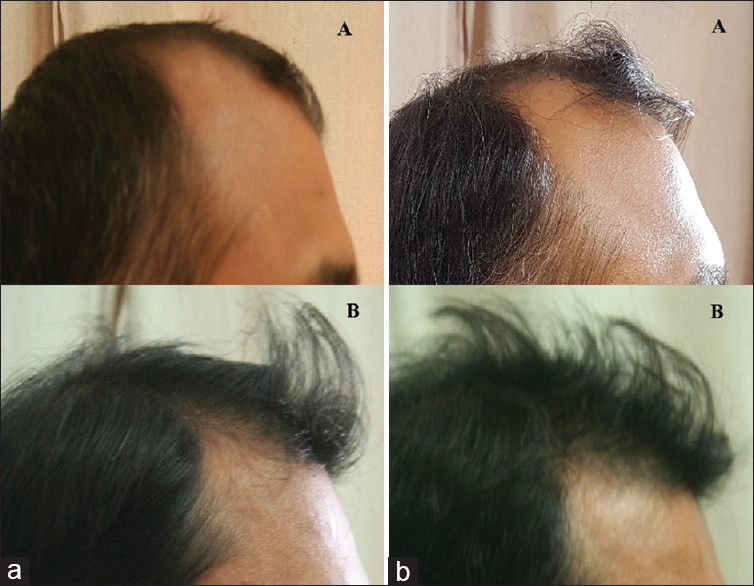 About 16 males were lost to follow-up because of prolonged follow-up period and delayed improvement in the hair loss. The rest 49 males were randomly allocated into microneedling procedure combined with mesosolution Group A (n = 25) and minoxidil Group B (n = 24). We excluded males who were on any allopathic treatment for hair loss within last 6 months, having other scalp dermatoses, prior major illness or hospitalization, thyroid disease, systemic illness, anemia, taking psychiatric medications, and those refusing for consent for enrolling into the study and long follow-up. Detailed clinical record was prepared on a predesigned pro forma, and all the patients were subjected to detailed history. Nature of the disease, various treatment options, and prognosis of each treatment modality were explained to the patient before enrolling them. Routine investigations such as complete blood count, renal and liver function test, random blood sugar, viral markers such as HIV, hepatitis B surface antigen, hepatitis C, and thyroid function test were carried out before commencing the treatment to rule out infection, thyroid disorder, anemia, and systemic illness. Patients were enrolled for mesotherapy group after performing intradermal allergy testing with mesosolution. After applying topical anesthesia, intradermal injections of mesosolution were given combined with microneedling. Any adverse events were noted during the procedure, and if no complications appeared, patient was allowed to go home. Mesohair solution contained 56 ingredients including 24 amino acids, 13 vitamins, 4 coenzymes, 4 nucleic acids, 5 minerals, and 2 reducing agents. The active ingredient was decapeptide 4, acetyl decapeptide, and copper tripeptide [Figure 1]. This procedure was repeated weekly for 1 month followed by fortnightly for 2nd month and then every monthly for 2 months. Hence, in total, eight sessions were carried out. Patients were advised not to wash, comb, or itch their scalp for 3 days after the procedure. They were asked to restrain from heavy exercise, apply oil or dye, and going out bareheaded in pollution for 3 days. Patient under minoxidil Group B was prescribed application of 2–3 ml of 5% minoxidil solution twice daily on the bald areas of scalp. They were explained the side effects such as initial hair loss for 1–2 months, headache, redness, and irritation. They were also reassured about the lag period of about 2–3 months for the improvement. All the enrolled males were evaluated before starting therapy and then monthly till 4 months. Gross photographs were taken under adequate illumination, identical settings, lighting, and position. Measuring tape was used to determine three fixed point on the scalp for future dermoscopic evaluation. Landmarks for each frontal region were the intersecting point between lines passing through ipsilateral tragus and lateral point of eyebrows and the intersection of two imaginary line crossing both the ears and glabella for vertex region. 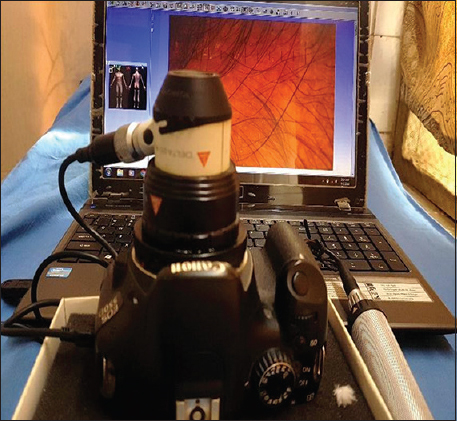 A Heine Delta 20 Plus videodermoscope (Germany) with polarized light that is attached with digital camera (Canon EOS 550 D Camera, Tokyo, Japan) was used for trichoscopy and trichoscan was performed on the same dermoscopic pictures through computer-based software [Figure 2]. Measuring tape was used to determine three fixed point on the scalp for future dermoscopic evaluation. Two subjective evaluating methods such as standard 7-point analysis scales and patient self-assessment score were used [Table 1] and [Table 2]. The data analyzed were from frontal region between the two groups. Dermoscopic and trichoscan readings in vertex region of the same patient was considered as control. Trichoscan performed provided total hair count, hair density, percentage of anagen hairs, catagen hairs, ratio of vellus hairs, and terminal hairs over an area of 1.195 cm 2. Trichoscopic parameters were evaluated by two observers. The data collected were analyzed in Graphpad instat software, Inc (California, version 3.06). Parameters in-between the two groups were compared using Mann–Whitney test (nonparametric) at all 5 time points. Difference in the parameters within the group at different time points was compared using paired t-test (parametric distribution) and Kruskal–Wallis test (nonparametric distribution). P < 0.05 was considered as statistical significant. Out of 65 enrolled males, 17 dropped the treatment. We randomly recruited the remaining 49 males into two therapeutic groups – mesotherapy (25) and minoxidil (24). Grade II (Norwood–Hamilton classification) was the most common (63%) grade of presentation followed by Grade III (27%) in our study [Graph 1]. Demographic details of participants of our study are mentioned in [Table 3]. The treatment result were analyzed at time points 0, 1st, 2nd, 3rd and 4th month with the help of dermoscope and trichoscan. As per described in methodology, here, we have described the result using five parameters in dermoscopy and eight parameters in trichoscan. We also have included two subjective scores – standard 7-point rating tool and patients self-assessment score which was based on physician and patients interpretation, respectively. [Table 4] and [Table 5] show the comparison of median values of dermoscopic and trichoscan parameters between Groups A and B at all time periods. [Table 6] demonstrates the intragroup comparison of dermoscopic parameters between 0 and 4th month in both the groups. In dermoscopic evaluation, the difference in the median values of variation in hair shaft diameter (except at 1st month), follicular units with single as well as multiple hairs, number of YD, and perifollicular halo was not significant between both the groups at all time points. 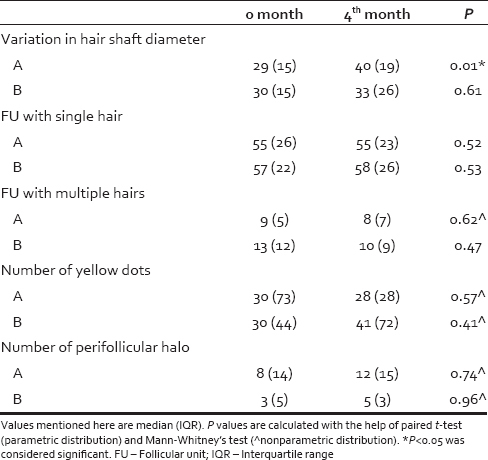 The difference in variation of hair shaft diameter was significant between both the groups at the end of 1 month (P = 0.04) [Table 4] and [Graph 2]. We found a significant increase (P = 0.01) in the variation of hair shaft diameter between pre- and post-treatment in mesotherapy group. Other four dermoscopic parameters failed to show any significant difference between pre- and post-treatment in both the groups [Table 6]. 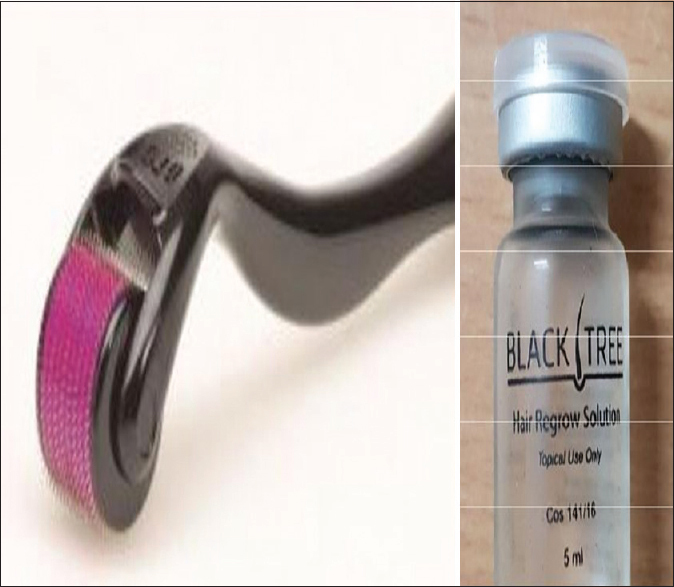 We found appearance of multiple black dots few days after mesotherapy procedure which later disappeared [Figure 4], [Figure 5], [Figure 6]. There was no statistical difference between the median values of trichoscan parameters between both the groups at all time periods [Table 5]. [Graph 2] represents the distribution of data of dermoscopic parameters throughout the study period in both Group A and Group B. Based on the standard 7-point scale, we did not observe any statistically significant difference in the number of males experiencing mild and moderate improvement in hair growth between Groups A and B [Table 7]. Twenty-three males under mesotherapy group experienced up to 25% improvement in hair loss and hair growth while 2 males noticed hair growth of about 25%–50%. Whereas all the males applying minoxidil solution felt improvement only up to 25% in hair loss and hair growth [Table 8]. In few males (4) having AGA involving vertex area, mesotherapy was more effective than frontal region (standard 7-point tool reaching moderately increased and patient self-assessment scale reaching 26%–50% improvement) [Figure 7] and [Figure 8]. Side effects of mesotherapy and minoxidil group are mentioned in [Table 9]. Availability of noninvasive, easy, handy, and accurate OPD assessment tools like dermoscope is a boon for a dermatologist to monitor therapeutic effects. Trichoscopy is a terminology used for dermoscopic examination of hair and scalp. It helps to visualize the hair shaft, scalp epidermis, and follicular openings with higher magnification and accuracy. Seleit et al. defined the dermoscopic features of AGA like variation in hair shaft diameter or anisotrihosis (>20%), YD, and peripilar sign. 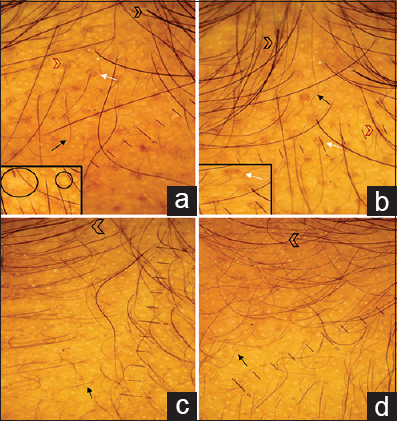 Predominance of pilosebaceous units with single hairs over frontal area of the scalp compared to occiput has been described by Rakowska et al. As dermoscopic diagnostic criteria for males are yet not described in literature, we have used the above parameters for evaluation of therapy. 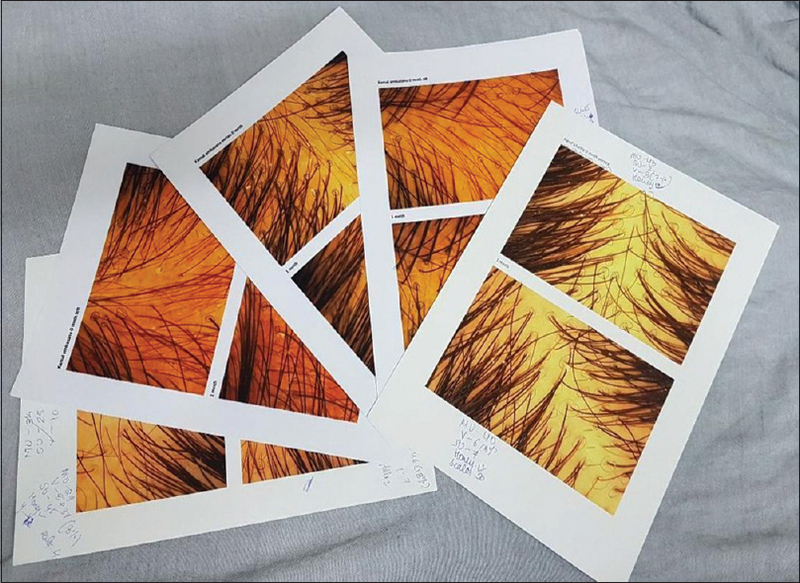 Parameters such as variation in hair shaft diameter, YD, and new tiny hairs can be used to identify the disease severity and assess the therapeutic response. Trichoscan is a computer-based software which combines standard epiluminescence microscopy with automatic digital image analysis for the measurement of all important hair parameters in situ. The major drawback with trichoscan is that it lacks the sensitivity to identify fine vellus hairs with diameter <16 μm. Minoxidil is an antihypertensive drug which opens ATP-sensitive potassium channels in cell membranes, leading to a vasodilatation. It also increases the expression of vascular endothelial growth factor in the dermal papillae and activates prostaglandin synthase-1, an enzyme that stimulates hair growth. Topical 5% and 2% minoxidil solution prevents progression of AGA in adult males and females, respectively. There is a very limited literature available on mesotherapy of scalp disorders. One Egyptian study observed significant increase in patient self-assessment score as well as increase in anagen hair count by trichogram in mesotherapy group compared to topical minoxidil group in females with AGA. 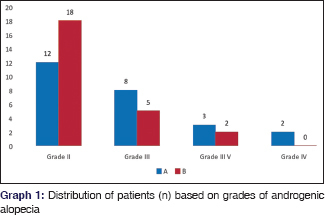 However, we did not observe any significant difference (P = 0.82) in patient self-assessment score between Groups A and B in males. We could not find literature of mesotherapy in male AGA. Hence, comparing the results of our study and the above-mentioned study, it can be interpreted that mesotherapy may not be equally effective in males as compared to females [Table 8]. Dhurat et al. in their study found that 18 and 22 males out of 50 achieved marked and moderate improvement, respectively, based on 7-point evaluation score in microneedling group while none of the patients in minoxidil group reached up to this improvement. In contrast to this, we observed moderate improvement in 5 males of mesotherapy group and 2 males of minoxidil group [Table 7]. We have included five dermoscopic parameters for evaluation [Table 4], [Table 6] and [Figure 4], [Figure 5], [Figure 6]. Perifollicular discoloration/halo/peripilar sign is another important dermoscopic finding in AGA which corresponds to lymphocytic infiltrate around hair follicle. It is observed in early stage of AGA and is not specific for AGA as it also sometimes found in telogen effluvium., We did not observe any significant difference in the number of perifollicular halo between groups and within the group (P = 0.96) [Table 4] and [Table 6]. Sufficient literature regarding the efficacy and safety profile of mesotherapy for hair loss are lacking. Few studies have reported the development of noncicatricial alopecia and abscess after use of mesotherapy on scalp., Fortunately, in our study, we did not come upon any major adverse events except few mild side effects [Table 9]. Those males undergoing mesotherapy commonly complained of erythema (88%) postprocedure which persisted for 1–2 h. This may be due to multiple microinjury following microneedling and injecting mesosolution. Patients applying minoxidil solution commonly complained of headache (17%) and erythema due to its vasodilatory action. This indicates safety of mesotherapy for AGA in our study. 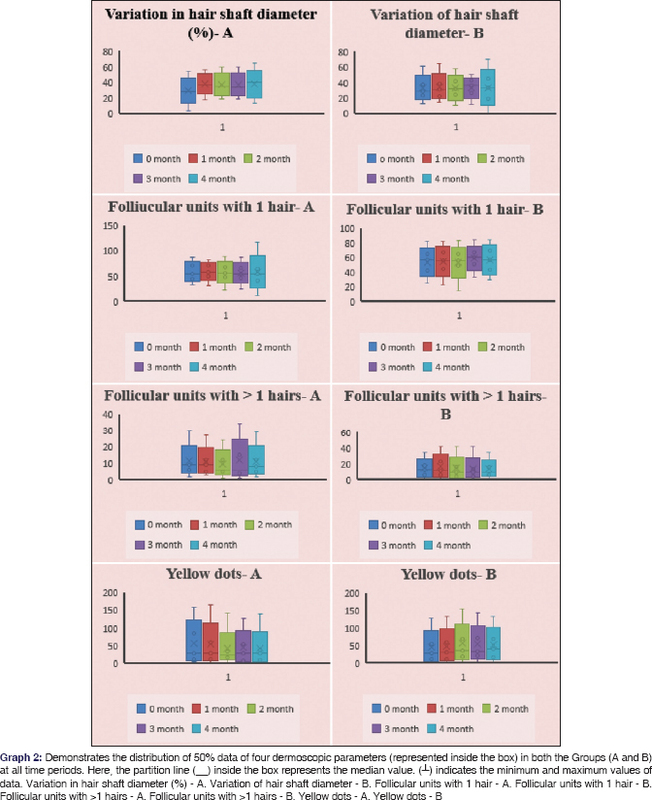 Furthermore, as minoxidil initially regulates the hair cycle and sheds more telogen, patient complains of hair loss (33%) in the initial months [Table 9]. Similarly, DeVillez observed worsening of frontotemporal baldness in his study group even after application on twice daily minoxidil. 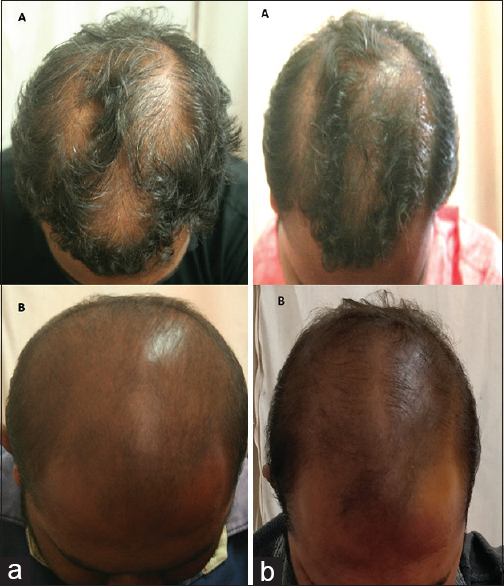 About 11 males of minoxidil group discontinued the treatment because of delay of therapeutic effect within 2 months. Similar observation was noted by Mapar and Omidian. No any systemic side effects were noted in the study group. Few limitations of our study include smaller sample size, patient losing to follow-up due to delayed treatment, and shorter duration of follow-up. Our study has demonstrated the role of trichoscopy in increasing the accuracy for diagnosing hair disorders, determining the disease stage, and identifying early response markers to treatment as well as to detect failure to treatment. Variation in hair shaft diameter increases earlier than other dermoscopic parameters and its increase represents new growth of thin hairs which indicates a positive response to treatment. Thus, it is a very important parameter for therapeutic monitoring. Other four dermoscopic and trichoscan parameters as well as subjective assessment tools did not show significant improvement of mesotherapy over minoxidil in male AGA. Still, further studies with larger sample size and longer follow-up period are required to establish the role of mesotherapy in AGA. Although effective therapeutic options are limited, AGA continues to remain an area where expanding research is adding more information regarding pathogenesis and newer therapeutic options are being developed accordingly. Sehgal VN, Kak R, Aggarwal A, Srivastava G, Rajput P. Male pattern androgenetic alopecia in an Indian context: A perspective study. J Eur Acad Dermatol Venereol 2007;21:473-9. Dhurat R, Saraogi P. Hair evaluation methods: Merits and demerits. Int J Trichology 2009;1:108-19. Mohamed H, Hala M. Comparative study between 2% minoxidil topical spray vs. intradermal injection (Mesotherapy) for treatment of androgenetic alopecia in female patients: A controlled, 4-month randomized trial. Egypt Dermatol Online J 2010;6:5. Kaufman KD, Girman CJ, Round EM, Johnson-Levonas AO, Shah AK, Rotonda J, et al. Progression of hair loss in men with androgenetic alopecia (male pattern hair loss): Long-term (5-year) controlled observational data in placebo-treated patients. Eur J Dermatol 2008;18:407-11. Seleit IA, El-Bakry OA, El-Sherif RM. Dermoscopy in hair disorders. Menoufia Med J 2014;27:762-5. Rakowska A, Slowinska M, Kowalska-Oledzka E, Olszewska M, Rudnicka L. Dermoscopy in female androgenic alopecia: Method standardization and diagnostic criteria. Int J Trichology 2009;1:123-30. Saraogi PP, Dhurat RS. 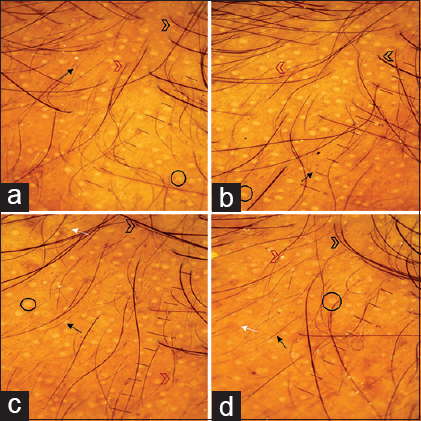 Automated digital image analysis (TrichoScan®) for human hair growth analysis: Ease versus errors. Int J Trichology 2010;2:5-13. Lee WS, Lee HJ, Choi GS, Cheong WK, Chow SK, Gabriel MT, et al. Guidelines for management of androgenetic alopecia based on BASP classification – The Asian consensus committee guideline. J Eur Acad Dermatol Venereol 2013;27:1026-34. Olsen EA, Dunlap FE, Funicella T, Koperski JA, Swinehart JM, Tschen EH, et al. A randomized clinical trial of 5% topical minoxidil versus 2% topical minoxidil and placebo in the treatment of androgenetic alopecia in men. J Am Acad Dermatol 2002;47:377-85. Dhurat R, Sukesh M, Avhad G, Dandale A, Pal A, Pund P, et al. A randomized evaluator blinded study of effect of microneedling in androgenetic alopecia: A pilot study. Int J Trichology 2013;5:6-11. Rudnicka L, Olszewska M, Rakowska A, Slowinska M. Trichoscopy update 2011. J Dermatol Case Rep 2011;5:82-8. Duque-Estrada B, Vincenzi C, Misciali C, Tosti A. Alopecia secondary to mesotherapy. J Am Acad Dermatol 2009;61:707-9. Kadry R, Hamadah I, Al-Issa A, Field L, Alrabiah F. Multifocal scalp abscess with subcutaneous fat necrosis and scarring alopecia as a complication of scalp mesotherapy. J Drugs Dermatol 2008;7:72-3. DeVillez RL. Topical minoxidil for androgenetic alopecia: Optimizing the chance for success by appropriate patient selection. Dermatologica 1987;175 Suppl 2:50-3. Mapar MA, Omidian M. Is topical minoxidil solution effective on androgenetic alopecia in routine daily practice? J Dermatolog Treat 2007;18:268-70.